Wheels and Deals #HugoftheWeek, goes to Holly Christie, WHO ORGANIZED GOLF FORE CARE !! Golf Fore Care is an important event that the Foundation organizes to raise funds to improve the quality of life of residents at York Care Center so we can offer them activities and programs that are not funded by government. This year the funds raised will go to improve dementia care. It is something that touches almost every family! Without fundraising, programs such as therapeutic activities and memory clinics would not be available to our residents. FROM CANADA’S HUGGABLE CAR DEALER… THE JIM GILBERT’S WHEELS AND DEALS HUG OF THE WEEK GOES TO… HOLLY CHRISTIE AND YORK FOUNDATION… WHO ORGANIZED GOLF FORE CARE !! IF YOU PLAYED LAST WEDNESDAY, THANK YOU… 100-PERCENT OF THE PROCEEDS IMPROVE DEMENTIA CARE AT YORK CARE CENTRE !! Using their creativity and imagination, youth from all across Canada took up the challenge to explore Canada’s history, culture, and identity and to discover what makes this country a truly special place. See what makes the winners of the 2015 Canada Day Challenge proud to be Canadian through art, photography and creative writing. Erics winning pictured is featured above and below is a picture of Eric, receiving our Huggable singing bear and a $20.00 gas card from Shawn Fasquel of Wheels and Deals for being selected as Canada’s Huggable Car Dealers Hug of the Week ..
FROM CANADA’S HUGGABLE CAR DEALER… THE JIM GILBERT’S WHEELS AND DEALS HUG OF THE WEEK GOES TO… 14-YEAR-OLD ERIC DUIVENVOORDEN FROM UPPER KINGSCLEAR !! HE’S THE NATIONAL PHOTO PRIZE WINNER IN THE CANADIAN HERITAGE DEPARTMENT’S “2015 CANADA DAY CHALLENGE” !! WE’RE PROUD TO YOU, ERIC !! FROM CANADA’S HUGGABLE CAR DEALER… THIS SATURDAY AT 9:30 AT CANADIAN TIRE NORTHSIDE PARKING LOT… JOIN THE RIDE IN SUPPORT OF THE CHALMERS HOSPITAL CHILD LIFE UNIT !! 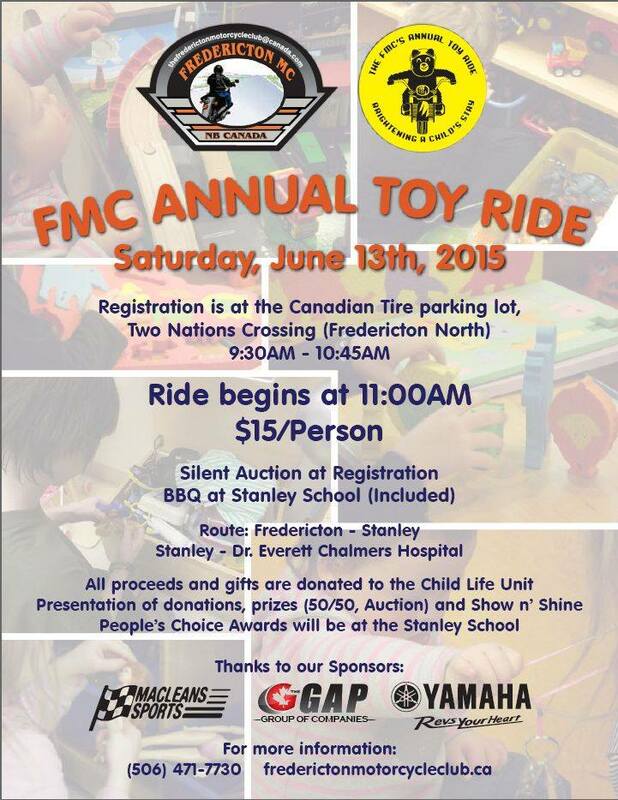 The Fredericton Motorcycle Club will receive 6 Wheels and Deals 3ft singing bears to start them off on their run…. We are approximately 55 to 75 members, with the numbers going up and down. Approximately 20 % of our members are Lady Riders while others ride with their partners. FMC members ages range from 15 to 65+ and children and grandchildren of the bikers are sometimes unofficial members. We meet most Sunday mornings in the summer and on the second Sunday of each month in the off season; 9 am in riding season and 10 am fall, winter, spring. In the winter we socialize, in the summer we eat and then ride. Typically all day. Generally we have an official meeting the second Sunday of each month during breakfast. In the last few years we have been running a Wednesday evening ride for anyone that wants to ride with us. These runs are usually 1.5 to 2 hours in duration. The Club was formed in the fall of 1982 by Colin and Nancy Carsons. Colin was on the N.B. Safety Council and got others from the council to join. The first president was Mike Fenety. We had our very first Toy Ride the summer of 1985 and have held a Toy Ride every single summer since. The FMC is the longest continuous supporter of the Children’s ward of the D.E.C.H. We organize our fund raising efforts with Crystal Doucette the director of child life services. We also support other clubs and their charitable fund raising events. People generally enjoy being around other people who enjoy the same likes and passion. Our link is the motorcycle. The freedom of the open road, no distractions, no radio, just two wheels and the wind. However when you stop for a break it’s always nice if you have a fellow rider that can share your sights and joys of the road. Many members join the club so they can meet other rider. It’s nice to know that if you get up on a Sunday morning, the sun is shining and the skies are clear, all you have to do is show up at a pre-determined site! There will always be at least one biker ready to go, half day, full day, what ever your heart desires. We help each other, not only do we promote safe riding but as well we share technical information. Most of our members find that over time their relationship changes from being a member of a club to a gathering of close friends. 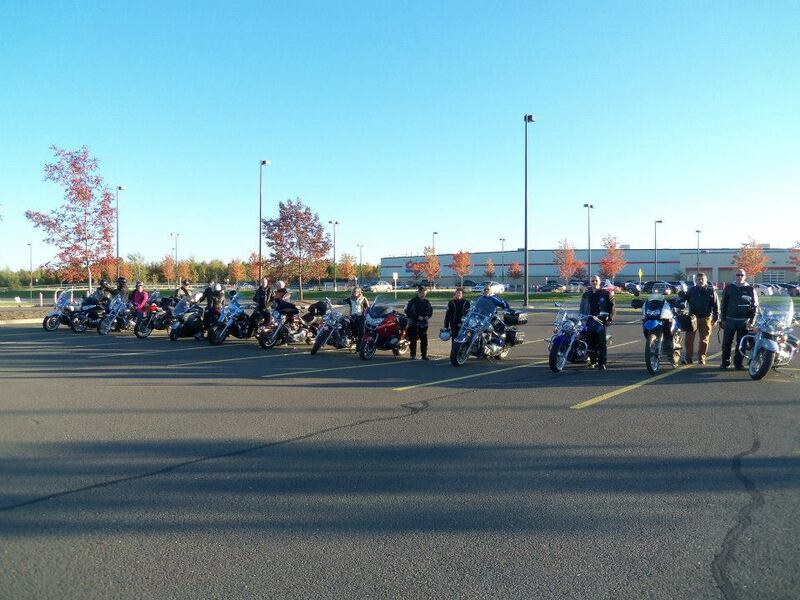 The summer of 2014 was our 30th Annual Toy Ride. Canada’s Huggable Car Dealer, will be giving Abby and Liam, one of our Signature 3 foot Singing Teddy Bears and a $20.00 Gas Card for being selected “The Jim Gilberts Wheels and Deals of the Week” for their very helpful efforts..
Shepherd’s House Orphanage Project: We are excited that you are joining with us in the mandate given to Evangelist Aaron Nelson and his wife Nathalie Nelson to help the less fortunate in Haiti, the poorest nation in the Western Hemisphere. Daily life is a struggle of survival for the children in Haiti. An estimated 65 percent of the population lives in poverty. In Rural areas that number is about 80 percent. More than 200 000 kids live in the streets. Our goal is to save as many as we can by bringing them off the streets and out of poverty to a new home and teach them the skills necessary to lift themselves out of misery and into a bright future. Infant mortality is 76 per 1,000 births. More than 1 child in 10 died before the age of 5. There is only 1 physician for ever 17, 064 inhabitants. (Haiti population is about 9 million) Upon arrival at the organization, each child will receive a good health care program. We will hire a private doctor for them. Ever child will undergo several medical tests during their first 6 months and/or every time when need be. The best medicine and vitamins will be provided when needed. 40 percent of the population is under the age of 14. Close to half of primary aged children are not attending schools. 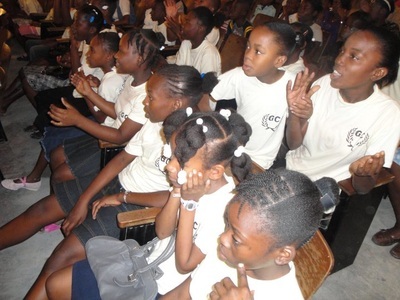 Haiti had an illiteracy rate of over 55 percent, the highest in the Americas. Our children will attend a non-discriminatory primary-secondary school in the country. We will use every good tool necessary such as: Reading materials, tutors, field trips, and sports to better educate those precious souls. We believe that every child has a right to go to school and we will make it happen. When one comes under, they will be fed, clothed, loved, and housed. They will receive treatment for their addictions and illnesses. They will be counseled, served, listened to, educated, and edified to their highest potential. Operation Compassion is to provide, information, and resources to help fulfill the call to feed the hungry, care for the elderly and to reach out to those in need. Our mission will provide men and women the opportunity to show the love of Christ by participating in hands-on ministry through volunteer service in construction, disaster relief and humanitarian assistance while enhancing other ministries so that they will be more effective, efficient and fruitful in their participation in the Great Commission. To mobilize a generation of disciples that know, love and follow Jesus Christ and actively advance the kingdom of God to the nations of the earth. To cultivate a discipleship movement that will gather, equip, mobilize, and make disciples, that will perpetuate disciples that make disciples, leaders that develop leaders, and churches that plant churches. To accomplish these goals, Shepherd’s House Ministries purchased land in Gressier, Haiti in June 2007. Engineering Ministries International (EMI) went to Haiti to design the orphanage at Shepherd’s House request. The design includes two Dormitories, a K-12 School, a Multiuse Building (with kitchen, dining, chapel, and study facilities), a Sports field and open space for the children to play and explore. Each dorm will house 100 children in ten bedrooms, one for girls and the other for boys. The school will allow the children to receive a traditional education with opportunities to learn trades and life skills. Utilities are required to sustain and educate each child and the new property has no water or sewer and although electricity is nearby, it is expensive and undependable. Therefore this design includes potable water system with a well and for the waste water; a septic/leach field system. For power, a diesel back up generator is included. A future self sustaining electrical/power system is desired; possibility utilizing Solar power. Please prayerfully consider how may become part of this labor of love to glorify God and serve the children of Haiti. We look forward to hearing how the Lord leads you. If you would like more information please contact us. 100 Men Who Care are Very honoured to be the recipient (along with all members of @100MenWhoCare) of @WheelsandDeals “Hug of the Week this week. Care like a man. Show your community just how manly you can be by joining other local men who want to make a measurable, positive impact right here in the Greater Fredericton Area. 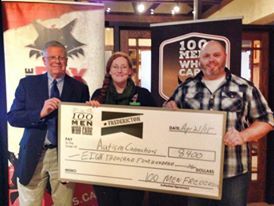 So we get 100 (or more) manly men (guys, dudes, bros, gentlemen, whatever you prefer) together, each with a $100 cheque in their pocket to give to 1 local charity that we all vote on that night. BAM! $10,000 in real money to a charity in our own backyard. We do it 4 times a year. How do you get involved? It’s simple. You join us right here on this website and make a commitment to donating $100 4 times in that year. When you sign up, you nominate a charity. Then you stand by your commitment shoulder to shoulder with other local men… attend the meetings and bring your cheque! It couldn’t be more simple. JOIN US and make a difference. You don’t have to give a lot, alone. You just have to give a little, together. It’s a simple concept that enables us to make a positive impact in our community, together as a group of like-minded men. We don’t technically exist. We are not registered. We have no directors, presidents or treasurers. We have no bank account. We have no operating budget, because our members write their cheques directly to the recipient charity. “We”, collectively, are just a group of guys getting together because we care about our community. We are not an entity, but a movement. Our core group of organizers are simply volunteers generously donating their time to try and make a difference. The goal of the group is to support the wonderful work our local charities do, in funds, exposure, and awareness. Charities are nominated by the membership. There are eligibility requirements. 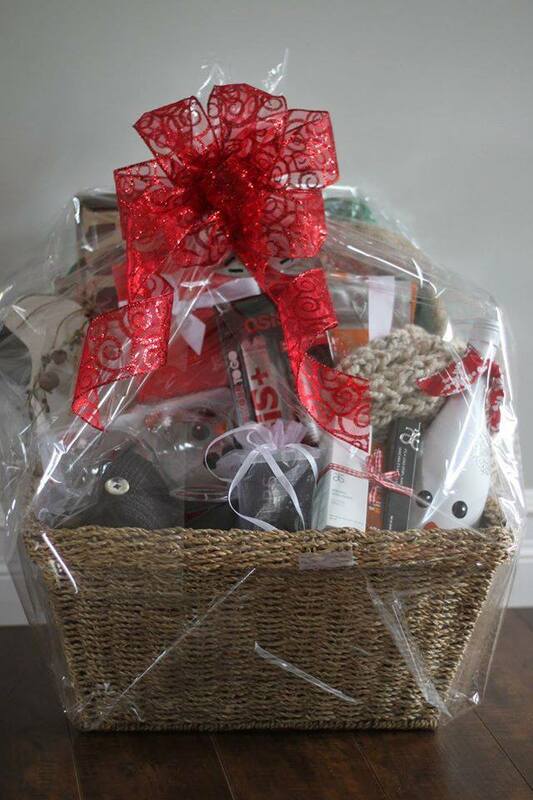 3 charities are randomly chosen by blind draw from our list of member-nominated charities. Representatives from the 3 selected charities will be asked to make a five-minute presentation to the group about that charities initiative and why they are deserving of the group’s vote. After the presentations, a ballot is held and the charity with the most votes by simple majority will be the recipient. All members must then write out their cheque to the charity with the most votes – no exceptions. The selected organization will receive a group donation of $10,000 or more. All the cheques are collected by the organizing committee and given to the chosen charity that evening. There is no proxy voting, but members who cannot attend must ensure their blank cheque (in a sealed envelope) reaches their ‘buddy’ or the meeting organizers before the meeting starts. Organizations under consideration must serve the Greater Fredericton Area and provide individual tax receipts directly to contributing members. The recipient charity is not eligible to be nominated/presented for 2 (two) years. The other two charities may be nominated/presented again after 6 (six) months. The exception is a specific program within a large organization (for example a specific department or program within a hospital), which may be considered again for a different program or department at any time. Ties will be decided by a draw. Meetings are diligently conducted in one hour or less (with ample opportunity for networking prior to each meeting). To minimize our costs, we depend on the generosity of those interested in hosting our meetings every three months. If you have a venue and would like to host a meeting, please contact us and we can work out the details. Then please Join Us and we’ll change our community together. LISE MARTIN-KEILTY, OF GEORGE STREET MIDDLE SCHOOL’S “CHAT TO THE FUTURE” ENTREPRENEURSHIP PROGRAM… RAISING OVER 47-HUNDRED DOLLARS TO HELP AN ORPHANAGE IN UGANDA !! THE JIM GILBERT’S WHEELS AND DEALS HUG OF THE WEEK , way to go LISE !! FROM CANADA’S HUGGABLE CAR DEALER… THE JIM GILBERT’S WHEELS AND DEALS HUG OF THE WEEK GOES TO… LISE MARTIN-KEILTY, OF GEORGE STREET MIDDLE SCHOOL’S “CHAT TO THE FUTURE” ENTREPRENEURSHIP PROGRAM… RAISING OVER 47-HUNDRED DOLLARS TO HELP AN ORPHANAGE IN UGANDA !! WAY TO GO, LISE !! To promote global citizenship with students by providing direct, personal contact with single/double orphans in Uganda and the opportunity to observe the transformation of lives through social entrepreneurship and cultural exchanges. To establish a stable home in a welcoming, involved community on a property that provides a sustainable food supply, practical skills, and academic support. $20,000 annually to continue meeting the needs of our 17 Ugandan orphans. $30,000 to purchase an appropriate piece of land. $100,000 to build a house that is appropriate for our mission and goal. 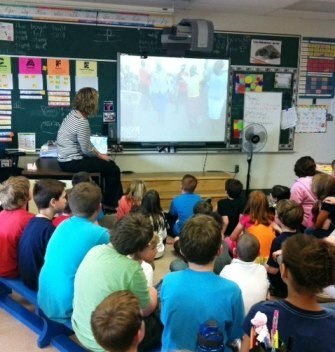 Provide intimate engagement with the plight of Ugandan children by sharing the stories and direct contact. TONY MCCOY, OF TORQUE !! THE JIM GILBERT’S WHEELS AND DEALS HUG OF THE WEEK … PLANNED TRAIL RIDE WITH BUDDIES TURNED INTO THE RESCUE OF ANOTHER, VERY STRANDED SNOWMOBILIER !! FOR ENSURING THAT EVERYONE GOT HOME SAFELY… THANK YOU, TONY AND FRIENDS !! FROM CANADA’S HUGGABLE CAR DEALER… THE JIM GILBERT’S WHEELS AND DEALS HUG OF THE WEEK GOES TO… TONY MCCOY, OF TORQUE !! HIS PLANNED TRAIL RIDE WITH BUDDIES TURNED INTO THE RESCUE OF ANOTHER, VERY STRANDED SNOWMOBILIER !! FOR ENSURING THAT EVERYONE GOT HOME SAFELY… THANK YOU, TONY AND FRIENDS ! Extreme Torque Motorsports Follow No One! THE JIM GILBERT’S WHEELS AND DEALS HUG OF THE WEEK GOES TO… RELISH CARES… A CHARITY FUNDRAISING AND AWARENESS PROGRAM !! SUPPORT YOUR FAVORITE CHARITY WHILE YOU ENJOY LUNCH… THANKS TO RIVERS CORBETT, AND THE CULINARY TEAM AT RELISH GOURMET BURGERS !! Are you a local, regional or national charity or non-profit organization? Each year we accept applications from charity and non-profit organizations to get our undivided attention and support to help raise awareness and funds for their organization. How does reLiSH Cares work? Our culinary team, led by Chef Ray Henry, designs a reLiSH Gourmet Burger specially with your cause in mind. We recently did one up for the Atlantic Cancer Research Institute called The Terminator…very cool! Your burger is then sold in the reLiSH location where your organization is known (local or regional) and proceeds go towards your organization. We also promote your burger extensively through our strong social media presence as well as all in-store promotions. Any other details you should know? We start new reLiSH Cares programs every two months and run them for seven days each. We reLiSH Life and your commitment to strong communities! FROM CANADA’S HUGGABLE CAR DEALER… THE JIM GILBERT’S WHEELS AND DEALS HUG OF THE WEEK GOES TO… RELISH CARES… A CHARITY FUNDRAISING AND AWARENESS PROGRAM !! SUPPORT YOUR FAVORITE CHARITY WHILE YOU ENJOY LUNCH… THANKS TO RIVERS CORBETT, AND THE CULINARY TEAM AT RELISH GOURMET BURGERS !! THE JIM GILBERT’S WHEELS AND DEALS HUG OF THE WEEK GOES TO… MICHELLE HUNTER !! SHE’S ORGANIZED A FUNDRAISER TO HELP A FREDERICTON MOTHER OF 3, PREPARING FOR HEART SURGERY!! HELP MICHELLE “HELP THE SAUNDERS FAMILY” AT YOU-CARING-DOT-COM !! FROM CANADA’S HUGGABLE CAR DEALER… THE JIM GILBERT’S WHEELS AND DEALS HUG OF THE WEEK GOES TO… MICHELLE HUNTER !! 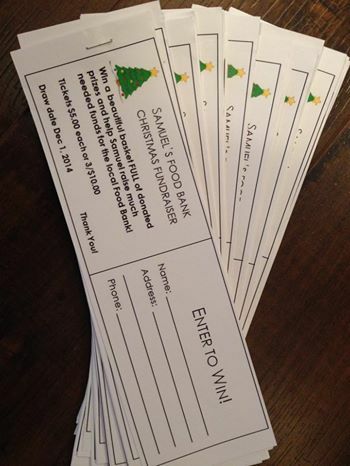 SHE’S ORGANIZED A FUNDRAISER TO HELP A FREDERICTON MOTHER OF 3, PREPARING FOR HEART SURGERY!! HELP MICHELLE “HELP THE SAUNDERS FAMILY” AT YOU-CARING-DOT-COM !! THE JIM GILBERT’S WHEELS AND DEALS HUG OF THE WEEK GOES TO… T-P THE TOWN !! 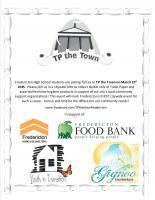 THIS SATURDAY, F-H-S STUDENTS WILL BE COLLECTING TOILET PAPER FOR ORGANIZATIONS THAT HELP THOSE IN NEED !! 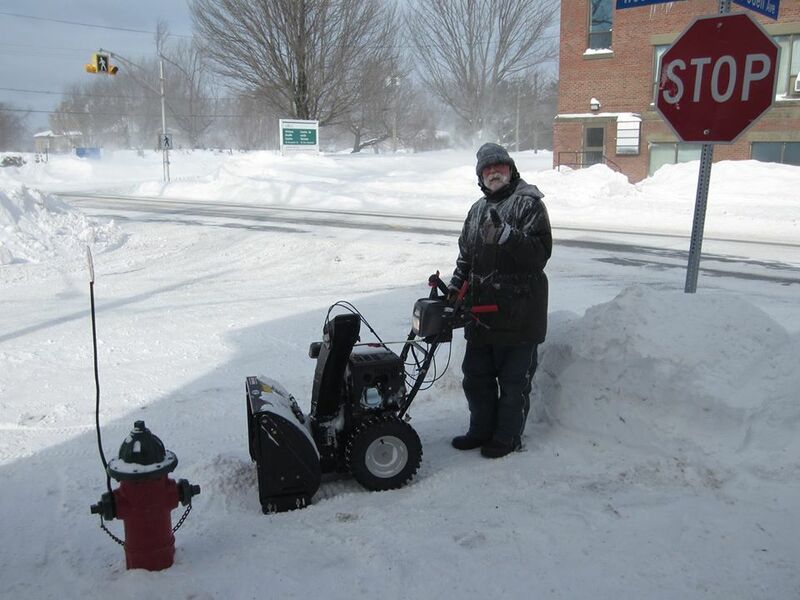 T-P THE TOWN… NOW THAT’S RESOURCEFUL THINKING !! THANK YOU !! Fredericton, New Brunswick, Canada – January 4, 2014 – Flow Home Cleaning is a locally-owned business that has teamed up with Cleaning For A Reason, an international nonprofit foundation. Flow Cleaning is dedicated to being Fredericton’s favorite home cleaning service by offering consistent, professional, and friendly customer service. Flow wants their clients to come home to a fresh, perfectly clean home and to feel their stress melt away as they step in the door. The service is personalized and clients are guaranteed 100 percent happiness and satisfaction. The staff at Flow are covered by company-funded health benefits plan and protected by WorkSafe NB. Owner Monica Danielski wants Flow Home Cleaning to be seen as a company that cares for their clients, their staff, and also their community in which they live. The company has agreed to help women battling cancer by cleaning two homes per month for four consecutive months at no charge. The only requirement is that the homes be within the company’s existing service area of Fredericton and surrounding areas. For more information about this company, go to http://www.flowcleaners.com. Cleaning For A Reason strives to aid women who are battling cancer by teaming up with professional cleaning companies across the United States and Canada. Together, these two forces offer free house cleaning to meet the needs of women, and since 2006, have donated more than $4.6 million in free services, helping more than 16,000 women with cancer. Based in Lewisville, TX, Cleaning For A Reason works with more than 1,200 residential cleaning companies and continues to grow and gain support. To learn more about Cleaning For A Reason and to apply for free house cleaning, see www.cleaningforareason.org. Wheels and Deals Hug of the Week…BRENT HALLETT! 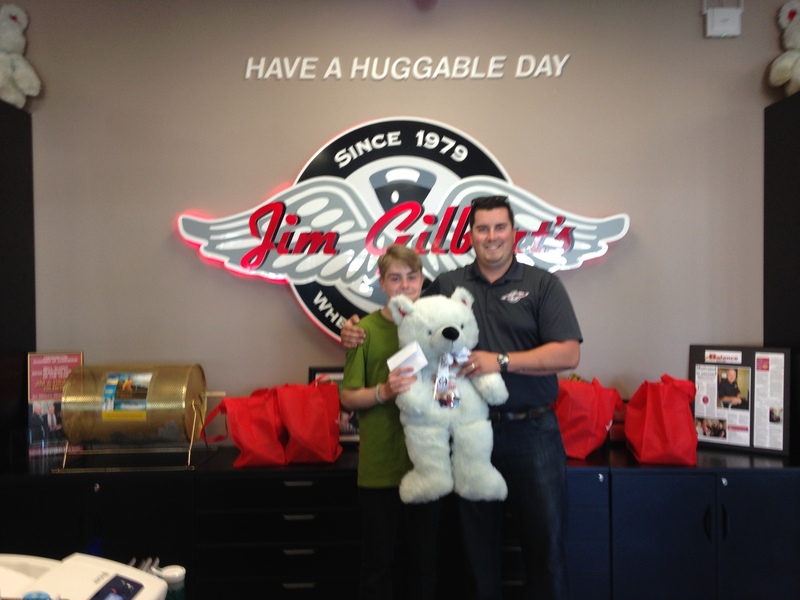 FROM CANADA’S HUGGABLE CAR DEALER… THE JIM GILBERT’S WHEELS AND DEALS HUG OF THE WEEK GOES TO… BRENT HALLETT !! COACHING FREDERICTON’S YOUTH IN HOCKEY AND BASEBALL, BRENT TEACHES MORE THAN JUST THE GAME… HE BUILDS CONFIDENT LEADERS, FOR OUR FUTURE !! THANK YOU BRENT !! Wheels and Deals Hug of the Week…..BILL ROBINSON !! Wheels and Deals Hug of the Week…..STEVE BURGESS, OF SIMMS HOME HARDWARE… AND THE GUYS FROM VICTORY MEAT MARKET !! FROM CANADA’S HUGGABLE CAR DEALER… THE JIM GILBERT’S WHEELS AND DEALS HUG OF THE WEEK GOES TO… STEVE BURGESS, OF SIMMS HOME HARDWARE… AND THE GUYS FROM VICTORY MEAT MARKET !! THEY WARMED HEARTS ON A BITTER DAY, WHEN THEY HIT THE STREETS WITH COFFEE AND DOUGHNUTS FOR THE HOMELESS !! Wheels and Deals Hug of the Week….VOLUNTEERS OF THE HEART AND STROKE FOUNDATION OF NEW BRUNSWICK! FROM CANADA’S HUGGABLE CAR DEALER… THE JIM GILBERT’S WHEELS AND DEALS HUG OF THE WEEK GOES TO… VOLUNTEERS OF THE HEART AND STROKE FOUNDATION OF NEW BRUNSWICK !! THEY’RE KNOCKING ON DOORS IN YOUR NEIGHBOURHOOD, RAISING FUNDS TO CREATE MORE SURVIVORS… PLEASE, GIVE GENEROUSLY !! February is Heart Month. Please give generously through your neighbourhood Heart and Stroke Foundation canvasser. Wheels and Deals Hug of the Week….1 YEAR OLD BRETT ELLEGOOD! FROM CANADA’S HUGGABLE CAR DEALER… THE JIM GILBERT’S WHEELS AND DEALS HUG OF THE WEEK GOES TO… 1-YEAR OLD BRETT ELLEGOOD !! LET’S HELP BRETT’S FAMILY OUT, AS THEY SUPPORT HIS CARE AT THE I-W-K IN HALIFAX … VISIT THE BRETT ELLEGOOD FUNDRAISER PAGE ON FACEBOOK !! Jim & Carole McDonald’s 1 year old grandson Brett Ellegood, son of Richard and Melinda Ellegood, was flown to the IWK on Tuesday Jan 20th. 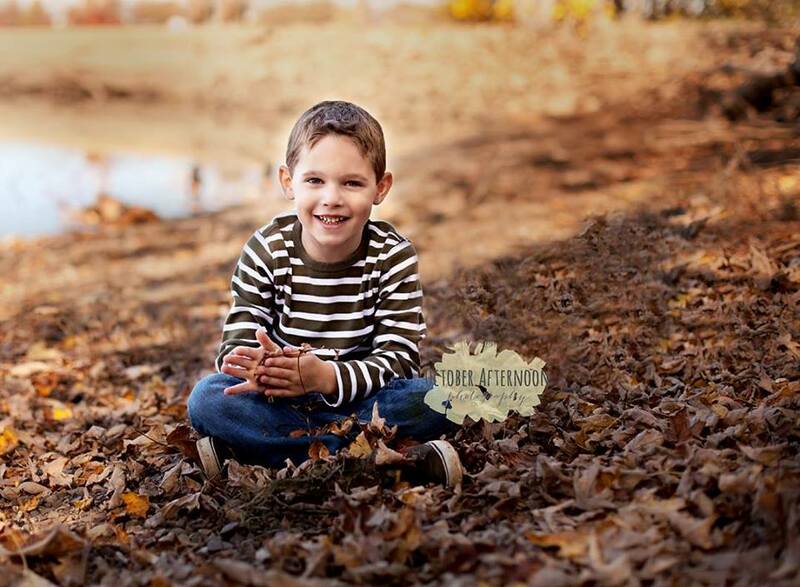 Young Brett has been diagnosed with a tumor on his right adrenal gland above his kidneys. They are going to operate on Brett and remove the tumor. Brett is also undergoing steroid treatment to correct his head bobbing and eye flutters. He will receive up to 6 months of chemo treatment. 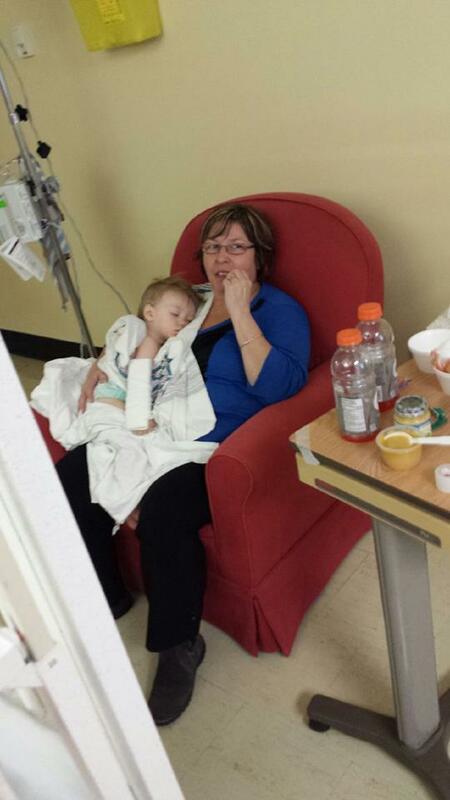 It is estimated Brett will be in the IWK hospital for at least one month. Wheels and Deals Hug of the Week….NASHWAAKSIS LIONS CLUB!! FROM CANADA’S HUGGABLE CAR DEALER… THE JIM GILBERT’S WHEELS AND DEALS HUG OF THE WEEK GOES TO… NASHWAAKSIS LIONS CLUB… AND THEIR RECENT “READ AND ROAR”, AT FREDERICTON PUBLIC LIBRARIES !! A BOOK FOR EACH CHILD… 600 IN TOTAL, WORTH 3-THOUSAND DOLLARS !! THANK YOU, LIONS !! 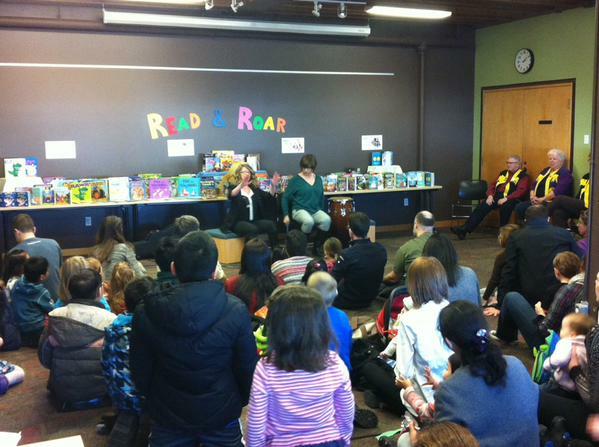 The Nashwaaksis Lions Club in Fredericton has joined forces with the city’s three public libraries to promote reading. The organization donated $3,000 worth of brand new books to children in Fredericton during the Read & Roar Book Giveaway Saturday. Children who stopped by one of the city’s three public libraries were able to choose a brand new book to take home with them. Richard Buchanan, a member of the Lions Club, says they wanted to do their part to help improve global literacy rates. Buchanan says they were able to buy the roughly 600 books through fundraising efforts like a weekly radio bingo, bottle drives and ticket drives. He says the organization will evaluate Saturday’s event, and may consider doing it on a regular basis in the future. Wheels and Deals Hug of the Week….JEFF RICHARDSON AND THE UNITED WAY TEAM!! 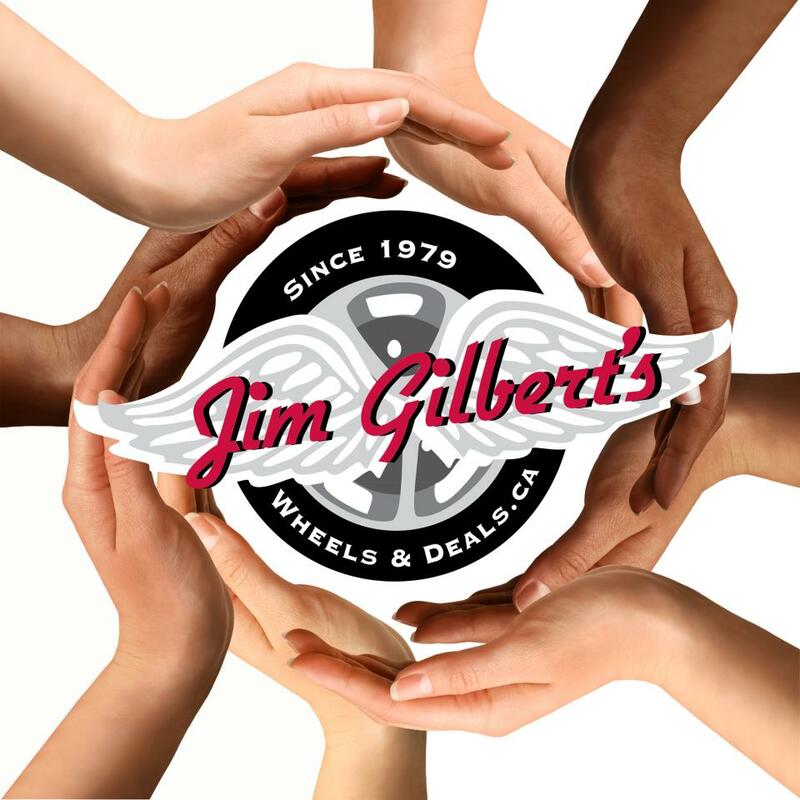 FROM CANADA’S HUGGABLE CAR DEALER… THE JIM GILBERT’S WHEELS AND DEALS HUG OF THE WEEK GOES TO… JEFF RICHARDSON AND THE UNITED WAY TEAM… ON BEHALF OF OVER 30 AGENCIES THAT SERVE THIS COMMUNITY !! NOW AT 90-PERCENT OF THEIR GOAL, LET’S BOOST THEM OVER THE TOP… DONATE TO THE UNITED WAY TODAY !! 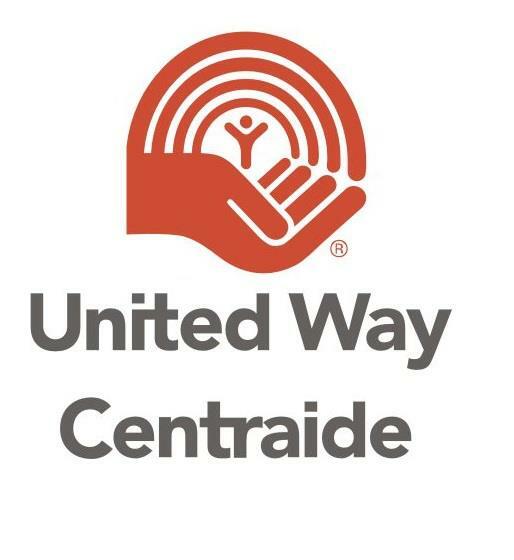 United Way/Centraide of Central N.B. is an incorporated non-profit charitable organization focused on supporting the healthy development of our community. In addition to running an annual fundraising campaign to support a vital network of human service programs, we work in collaboration with people from political, corporate, labour and social service sectors to create capacity within the communities we serve, and to create community impact. Wheels and Deals Hug of the Week….PAMELA BRYSON-WEAVER!! FROM CANADA’S HUGGABLE CAR DEALER… THE JIM GILBERT’S WHEELS AND DEALS HUG OF THE WEEK GOES TO… PAMELA BRYSON-WEAVER !! 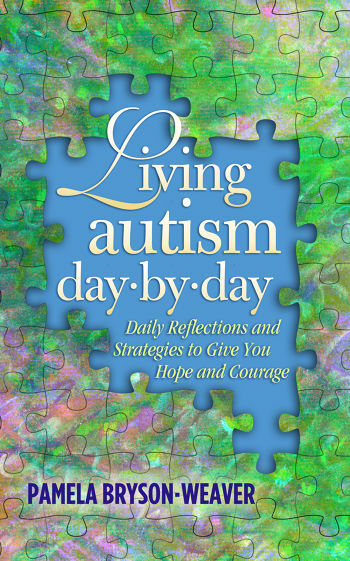 CHECK AMAZON’S BEST SELLERS FOR HER NEW BOOK, LIVING WITH AUTISM DAY BY DAY !! PAMELA… THANK YOU FOR INSPIRING “EMPOWERMENT” !! 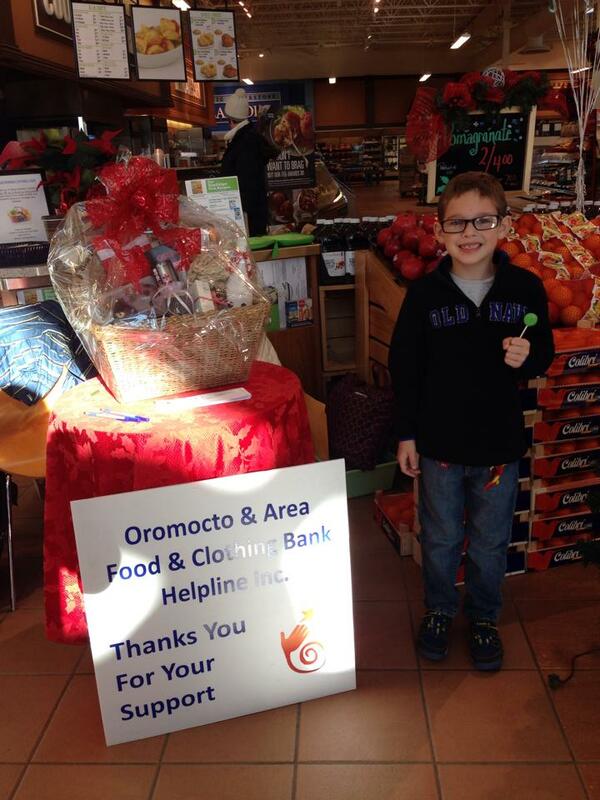 Wheels and Deals Hug of the Week…..SAMUEL COMEAU’S FUNDRAISER FOR OROMOCTO AND AREA FOOD AND CLOTHING BANK HELPLINE !! FROM CANADA’S HUGGABLE CAR DEALER… THE JIM GILBERT’S WHEELS AND DEALS HUG OF THE WEEK GOES TO… SAMUEL COMEAU’S FUNDRAISER FOR OROMOCTO AND AREA FOOD AND CLOTHING BANK HELPLINE !! FIND HIM ON FACEBOOK, FOR YOUR CHANCE TO WIN !! A SHARING SPIRIT… SAMUEL COMEAU ! !